Envairo maximizes employee comfort and productivity by making your air responsive to your people. If your office gets too hot or too cold, we can help. Spend less time making adjustments to air conditioning. Provide the office comfort and air quality employees deserve. Reduce energy bills by 10-20%. 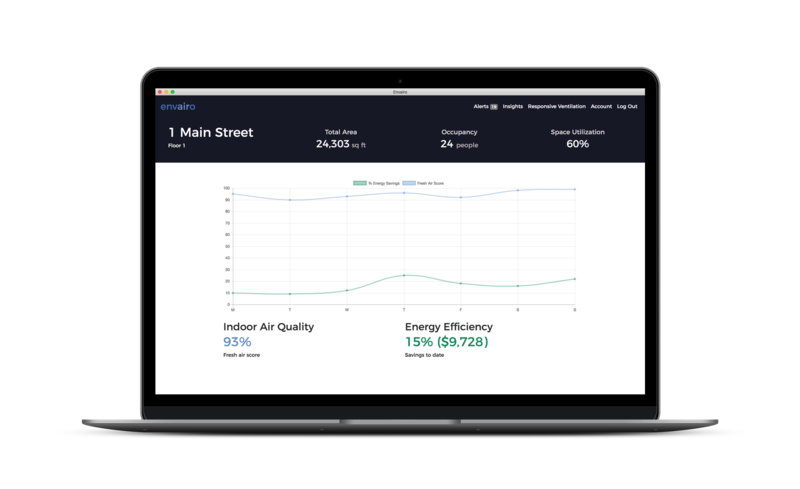 Envairo increases office comfort by adapting cooling and ventilation based on room occupancy. Plenty of fresh air for everyone, and no more sweaters in the summer. Envairo reduces ventilation and cooling to save energy when occupancy is low. Not getting enough fresh air makes people drowsy, hurts focus and can compromise health. It's also hard to work if you're freezing or sweltering. Spaces can save 10-20% on their total energy costs and enjoy a payback of less than 1 year. Envairo works with or without an existing building management system. Reduce or eliminate complaints to office and facilities managers that the office is too cold or too hot. Ensure higher air quality at lower energy costs for improved employee productivity and health. Improve your relationship with building tenants and owners by switching to a performance based model. Leverage our simple, lightweight system that proactively keeps your clients happy. Show tenants you're serious about indoor air quality and temperature control. Get high-resolution visibility into how assets are being used. Reduce operating costs by 30 to 80 cents per square foot per year on energy savings alone. Envairo works with your existing HVAC contractor or brings in one of our trusted partners to get you up and running in a day or two. People give off heat, carbon dioxide, and moisture. Our software analyzes the data to determine how many people are in each room, immediately adjusting the temperature accordingly. The system gets smarter over time as it learns your office-specific dynamics. You access the Envairo dashboard via computer, tablet, or smartphone. Track energy savings, indoor air quality, thermal comfort and occupancy. Get custom alerts and reports.